Your escapade begins when the transport vehicle stops at the launching point in Rendang Village, where rafts lined the riverside. 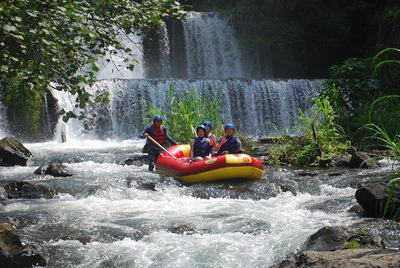 To the background music of the splashing, rushing river, the staff will help you choose your life jacket and helmet, and give you brief instructions on techniques and safety codes. “Paddle forward! Backward!” You follow the orders of your captain-instructor and learn how to navigate the numerous obstacles with your crew. 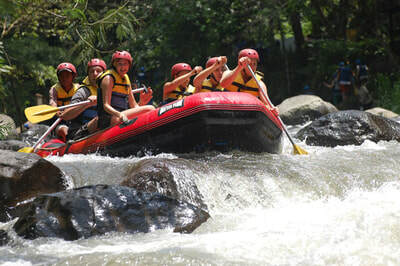 Conquer Bali’s longest and most scenic river-rafting route, 16 km of exciting grade 3 & 4 rafting. Your 2.5 hours adventure finishes at Tangkup Village, with facilities for showering and changing out of wet clothes and then enjoyed lunch at our restaurant. The spring-fed Telaga Waja river flows through wild tropical jungle past towering trees and vines, creating a thrilling beginner-class rafting course. The water is extremely clear, and flows around numerous hairpin curves along the 16 km course. 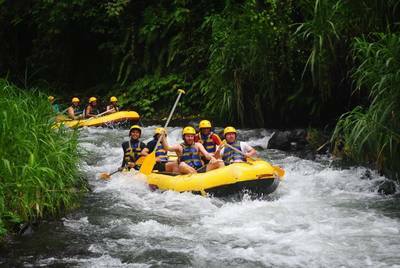 Enjoy navigating numerous rapids and steering clear of the rocks. 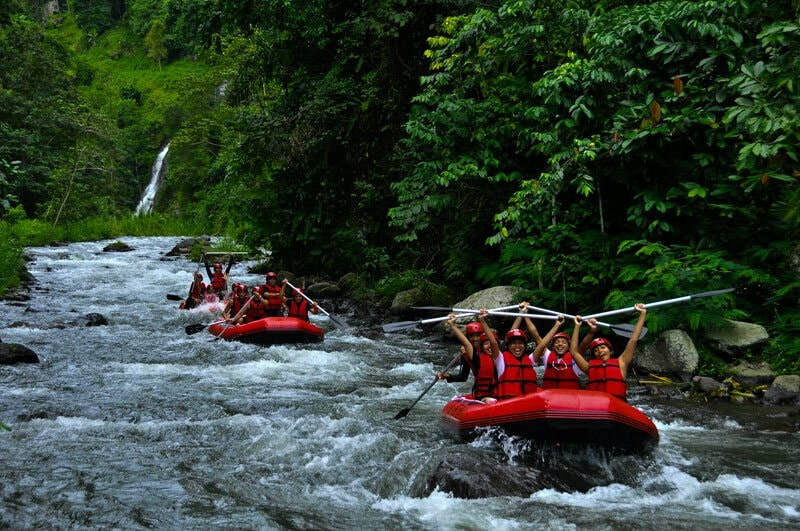 Paddle right under a natural waterfall shower, and discover all the thrills and action that this dynamic rafting course offers. Explore Ayung River, the longest river in Bali on Bali’s most-loved adventure tour, a white water rafting! Our friendly and experienced raft guides will take you on an exhilarating, safe and fun trip. 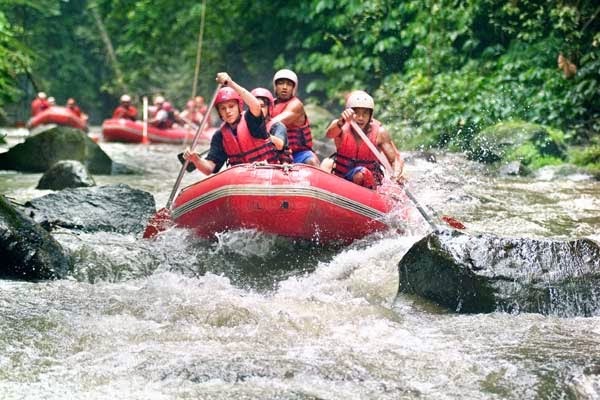 You’ll find a level of professionalism that offering unique insights and memorable experiences through the lush rainforest for your memorable adventure, here in Bali. Bali as a paradise island is very popular by its culture and nature. 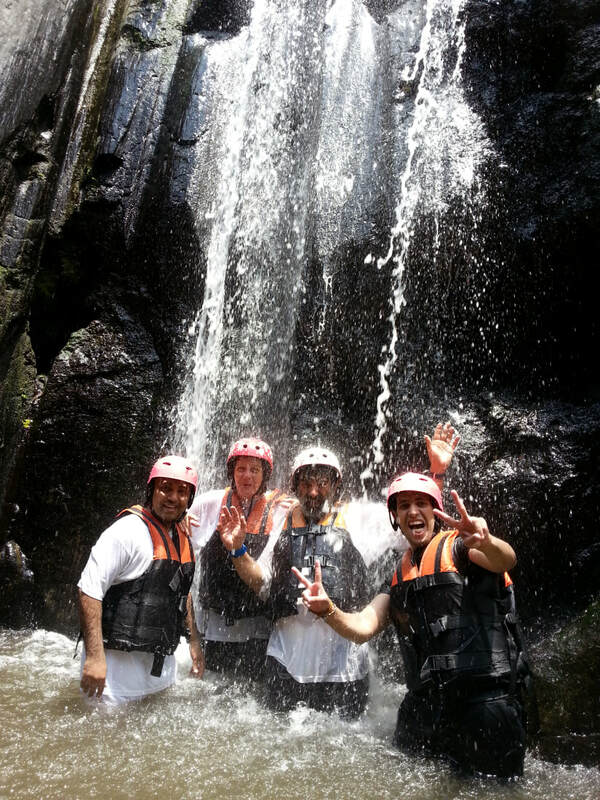 Magnificent mountain view, gorges rice fields and stunning river and valley. The longest river in Bali named with Ayung, taken from balinese word of “ayu” meaning “beautiful”. For many years, Ayung River has become popular for the white water rafting adventure. 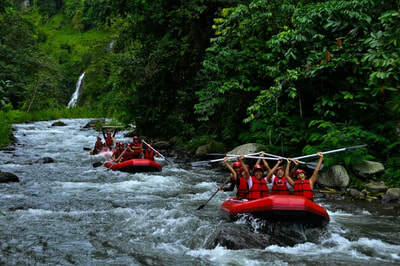 Ayung river is classified into class II to III but may raise up during the raining season. 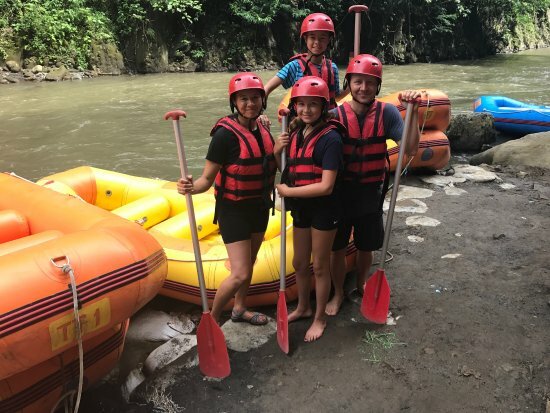 The scenery along the river is spectacular, and as you come rafting down to challenge the rapids with us, you will be able to immerse yourself in the gorgeous rain forest bordering the river. 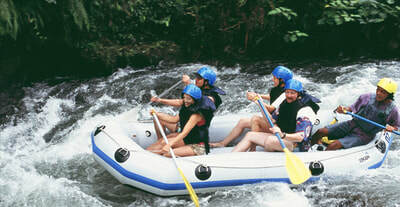 Your exciting rafting adventure will approximately 2 hours, guided by our experienced guides. It’s the best way to discover the beauty of Ayung River valley and experience the excitement, rapids by rapids. As you arriving our reception, enjoy a refreshment while you do a registration after it. From here you can prepare yourself for the rafting and locker is available for free to save your belongings. Once you ready, your rafting guide will lead you to the starting point shuttled with air conditioned car that will take about 10 – 15 minutes drive. 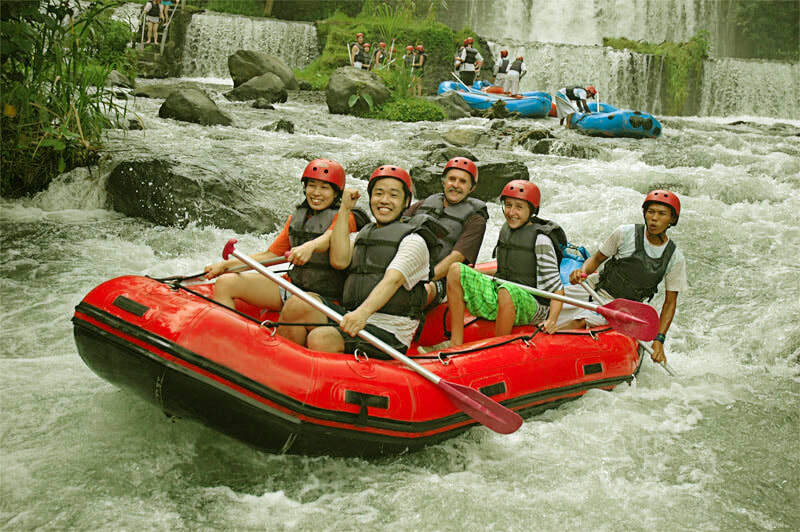 Our lobby at the start point is set in the middle of rice field and here, you will be equipped with helmet, life jacket and paddle. 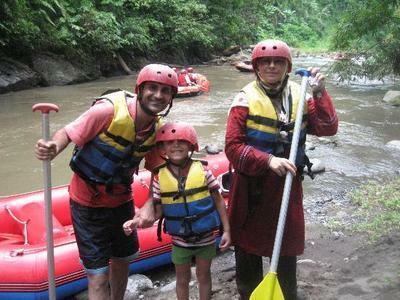 As you reaching the river by 15 minutes walks through rice fields and tropical jungle, your guide begin with an introduction and will brief you for the safety procedure and tips to have an enjoyable rafting experience. Ready, Get Set and GO! 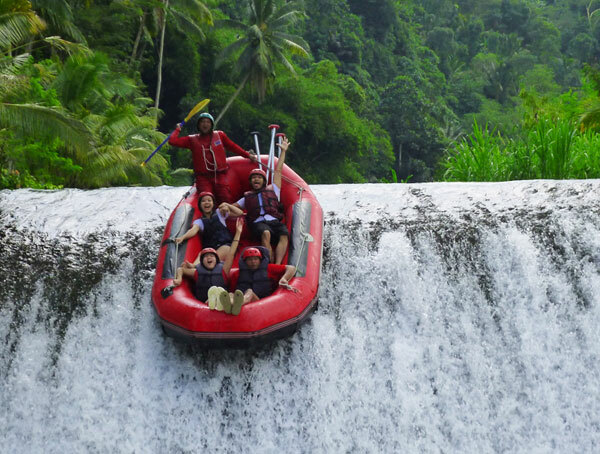 You’ll set off on your 2 hour rafting adventure – the an unrivaled and unique way to appreciate the natural scenery of Bali. 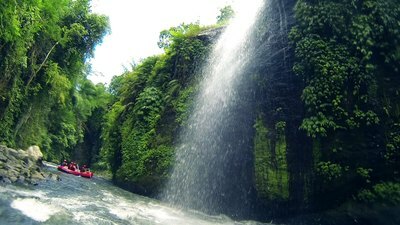 Paddling down the river, you’ll see dramatic waterfalls, unique wall carving, lush rain forest, verdant rice paddies, high cliffs and breathtaking gorges. 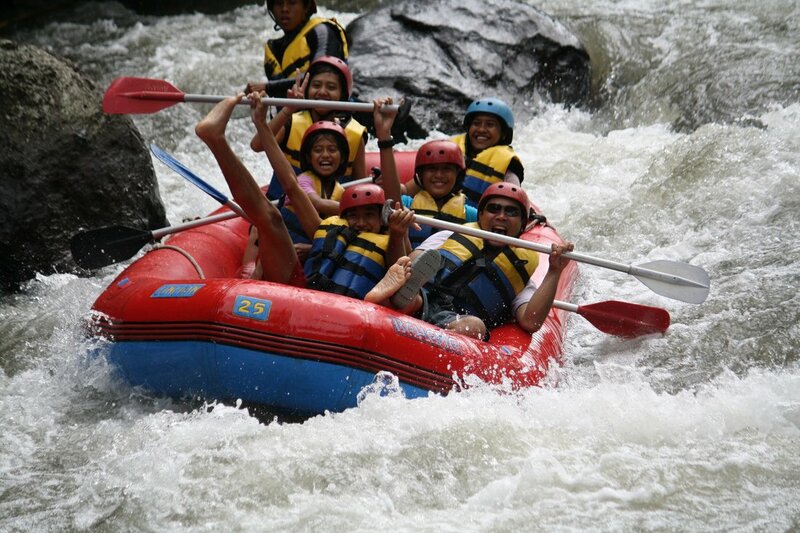 Enjoy the excitement, rapids by rapids which will make you wet and wild! 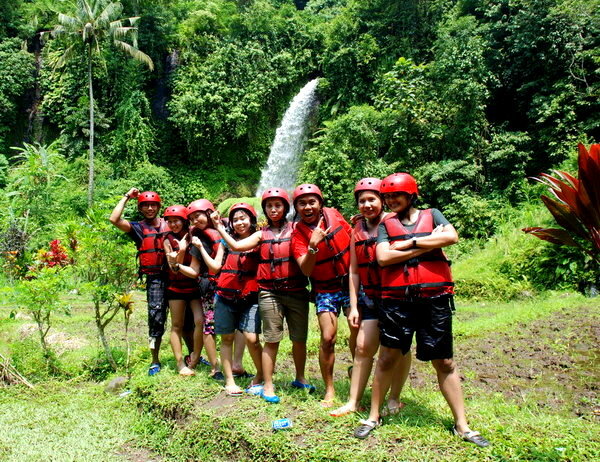 Your guides will entertaining you with jokes and pointing some of point of interest to make your experience even better, while keeping your safety in mind. 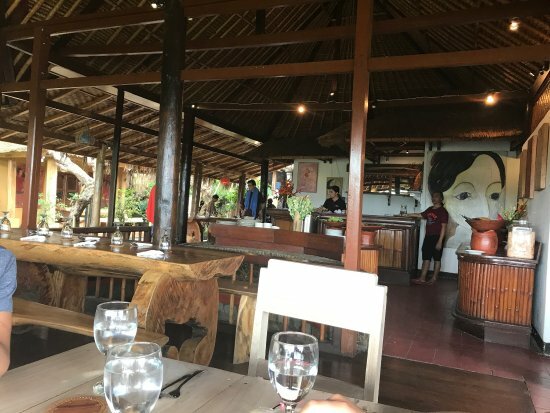 Upon completion, take a shower, dressed up and ready for the tasty and flavorful buffet lunch is served in our duplex restaurant with stunning views of the Ayung valley and rice fields. 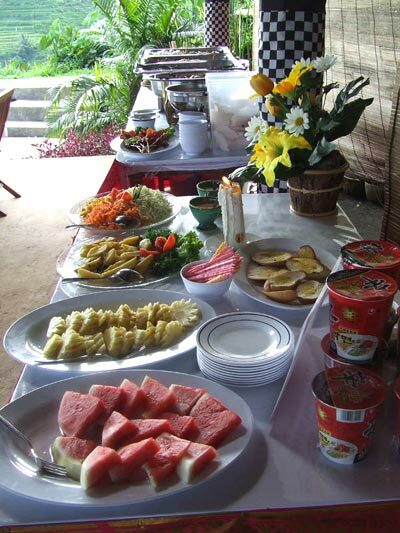 Our facility also includes hot showers, toilets, bar, and tropical garden with free Wi-Fi access throughout.